Posted on July 13, 2011 by Marie	This entry was posted in blog, design a-z, WordPress. Hello. I just wanted to take a second to thank you for this excellent resource! I am fluent in html (no, I am not a dinosaur!!) and am getting ready to try to teach someone I love about WordPress, websites, and was looking for an overview that would both inform and inspire someone to learn WordPress. The snaps of html in your article are an excellent visual and your explanations make website creation seem less daunting. I just wanted to thank you for putting up such a useful tool (and for FREE!). Hi Peggy, thank you for your comment! We are delighted that you found our post useful. 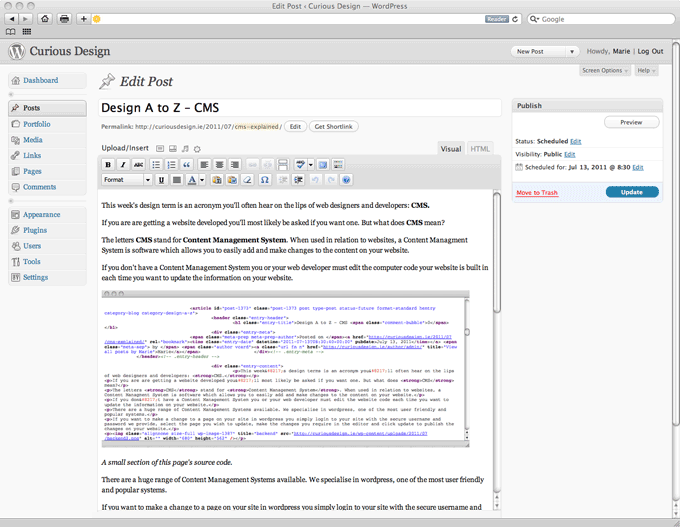 We are big fans of CMS and WordPress in particular. Best of luck with your lesson!